Mini Bench Vice [PVC7002]. Ideal for portable workbenches, kitchen tables, and any 20mm-thick platform requiring strong, temporary fixing. Jaw Width: 40mm. Jaw Capacity: 30mm. Hobby Bench Vice [PVC7006]. Another great value for workbenches and other 25mm-thick platforms requiring strong, temporary fixing. Cross-cut face plates on vice jaws ensure solid grip. And the adjustable clamp head allows for uneven surfaces. Jaw Width: 60mm. Jaw Capacity: 50mm. Multi-Angle Bench Vice [PVC7008]. Brilliantly versatile! Manoeuver larger work pieces to the most accessible angle. Rotate the vice head 360 degrees. Tilt it 0–90 degrees. Then lock into position by a single lever! Removable rubber jaw grips safely hold delicate objects. The generous jaws also sport vertical and horizontal V-Grooves for gripping rods, wire and other circular objects. And the adjustable lower clamp features soft upper grip to protect work surfaces from damage. Jaw Width: 75mm. Jaw Capacity (without rubber grips): 55mm. Jaw Capacity (with rubber grips): 50mm. 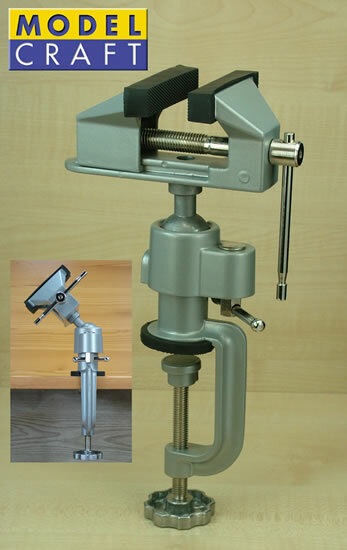 Universal Suction Vice [PVC7012]. Don't live life on the edge! The powerful, multi-position suction base fixes to virtually any flat, smooth surface. Rotate the vice head 360 degrees. Tilt it 0–90 degrees. Then lock into position by a single lever! Removable rubber jaw grips safely hold delicate objects. And jaws sport vertical and horizontal V-Grooves for gripping rods, wire and other circular objects. Jaw Width: 70mm. Jaw Capacity (without rubber grips): 70mm. Jaw Capacity (with rubber grips): 65mm. The new MODELCRAFT® vices join SHESTO’s extensive range of handy “holders”. Other helpful devices in the line include the Helping Hand with Glass Magnifier [PCL2228], Mini Vice [PVC1650], Universal Work Holder [PCL8010], Bench Universal Work Holder [PCL8010/B], hand-held Brass Hand Vice [PVC0087], and Soft Grip Wedge-type Work Holder [PCL8025] – as well as an array of plastic and metal G-Clamps, metal Toolmakers Parallel Clamps, and Forceps. For over a century, SHESTO LTD have led the world in quality tools for professionals and enthusiasts alike. In addition to its popular MODELCRAFT® tools range, the company’s comprehensive lines of creative, precision products include SPRAYCRAFT®, JEWELTOOL®, LIGHTCRAFT®, ROTACRAFT®, and FOILART®. SHESTO currently supply tools to over 60 countries worldwide.